Emily Rapp has survived a birth defect and didn't want to take a chance when she decides to get pregnant. Her and her husband has genetic testing to make sure that her child wouldn't have to go through what she went through as a child. All except that those tests weren't developed enough to test for the type of Tay-Sachs her son was born with. This memoir weaves in quotes from familiar authors like Mary Shelley, Sylvia Plath and C.S. Lewis. I had no idea that Mary Shelley was a feminist and had such an interesting life! These quotes and insights put losing a child into a new light. 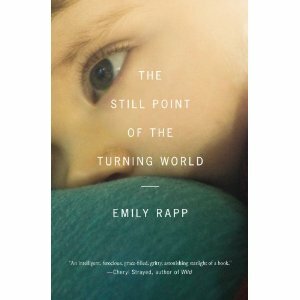 The story that Rapp tells should be filled with despair, but she does present everything in a positive light. If you know your child only has a short time on this earth, you should do everything you can to live in the moment and not dwell on what will happen tomorrow. She does prepare for the inevitable and with the help of hospice she makes the seemingly impossible decisions. even though your heart will break, this really is an uplifting story. I just heard this author on Fresh Air and would love to win a copy of this book. Thanks for the chance, Mary. Oh this book looks great, adding to to my TBR and I hope I win it. If not I'm getting myself a copy.